Although the sign in front of the church indicated that they only had services on the 2nd and 4th Sunday of the month, Dallas and I wanted to leave early in case anyone came by. After a restless night, we washed off our bikes and our legs with the hose outside, and prepared for a day of riding more than 50 miles (finally). 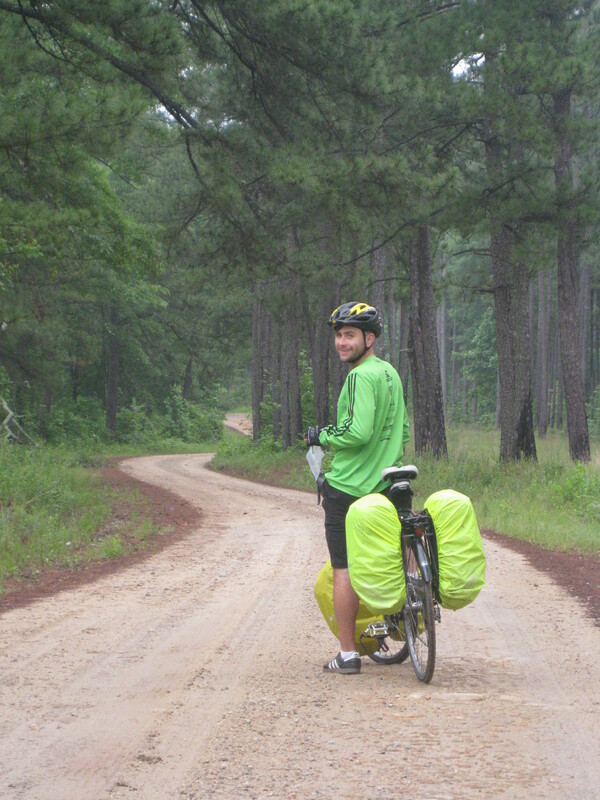 The first stop was just over 20 miles to Milledgeville, where I had contacted a few couchsurfers the day before. We had been thinking we were about ready to stay in a house and get a real shower (and maybe do some laundry), and there were several hosts in Milledgeville, since there was a college there. We obviously never made it to Milledgeville that night and ended up camping behind the church instead. We did make it to Milledgeville before noon on Monday, and James, one of the couchsurfers I had contacted, directed us to the bike shop where he worked and let us leave our bikes under the carport while we walked to the Metropolis Cafe for lunch. It began pouring before we made it to the downtown area, and we took cover under the carport of a dental office just a few blocks away while I contacted James. The rain didn’t last long, and by the time we arrived at Oconee Outfitters, the sun was shining strongly. After lunch, Dallas and I went around the corner to Blackbird Coffee, where we shared coffee and lounged on the couch for a few hours, getting some much-needed rest. Milledgeville has an interesting history, and it would have been nice to stay there a bit longer. It had been the capital of the Confederate states before the Civil War and was the capital of Georgia from 1804 to 1868. 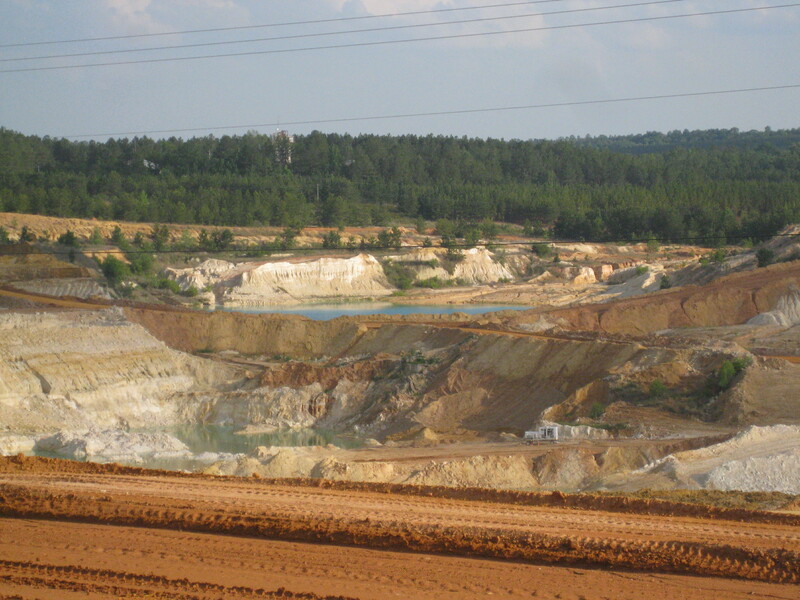 View from the road – Kaolinite mining? We finally got moving again around rush hour, which was a bad time to leave the town. The road Garmin directed us onto was picturesque but hilly and full of blind turns. Within a mile after turning onto that shoulderless road, we heard the sound of brakes squealing behind us, scaring both of us into riding off the road and onto the grass. An SUV driver who probably hadn’t been paying attention had likely swerved to avoid us but then had to stop to avoid an oncoming car. The incident loaded me with a rush of adrenaline that increased our average pace over the next several miles. Georgia really is a beautiful state, and I must stress again that the people are so friendly and accommodating. Most of the traffic gave us a wide berth, pulling over at least a full lane wherever possible. In Sandersville, we were met with even more hospitality and generosity when we stopped to eat dinner. Dallas and I had been planning to camp out again in Tenille, at a small city park we saw on the map. Upon arriving in Tenille, we had to ride up a few miles to Sandersville in order to find an open place where we could get food. The choices in Sandersville were all evil – an array of fast food restaurants including Sonic, Zaxby’s, McDonald’s and Waffle House. We were hungry and settled on Huddle House, which seemed to offer the widest selection. After locking out bikes up so we could see them from the window, an older couple at a nearby table started talking to us. The conversation began like so many of the previous ones, asking us where we came from and where we’re going, commenting on how far it is and warning us to be careful. The wife did most of the talking, and throughout our meal, she would come over to our table and have something else to say. Her Georgian accent was really tough for me to understand, and I felt like we weren’t engaging as we could have been, especially since we were preoccupied with consuming the food in front of us. Towards the end of our meal, she came back and said she had talked to the sheriff, and they were going to watch over us to make sure we stayed safe while we were in Sandersville. Another boy in the restaurant joined in and recommended Kaolin Park for us to camp that night. The woman gave us her phone number so we could call her if we got lost trying to find the park. They offered us a ride there in their truck, but we weren’t quite ready to leave yet. When we were about done eating, a police officer appeared from somewhere within the restaurant to suggest another place for us to stay. Apparently, the Days Inn has a program where they let “indigents” stay in their motel for free one night. While he recognized that we were not “indigents”, he said he would see if he could set us up to stay there. It turned out that the police officer was our waitress’s husband, and the boy who had suggested Kaolin park for camping was her son. We rode about 2 miles down the road to meet the officer at the police station so he could check our IDs and then rode a few more miles to the Days Inn. On our way, another patrolman rolled down his window to tell us they were waiting for us. The first officer met us again at the Days Inn to make sure we arrived safely before driving off. It was after 11pm by the time we checked into the motel and enjoyed our first shower since leaving Atlanta. We also seized the opportunity to wash some of our cycling clothes while we had running water, clean our bikes with the motel’s provided rags and re-oil our chains. The bed was so comfortable that we slept in and had yet another late start to the next day. 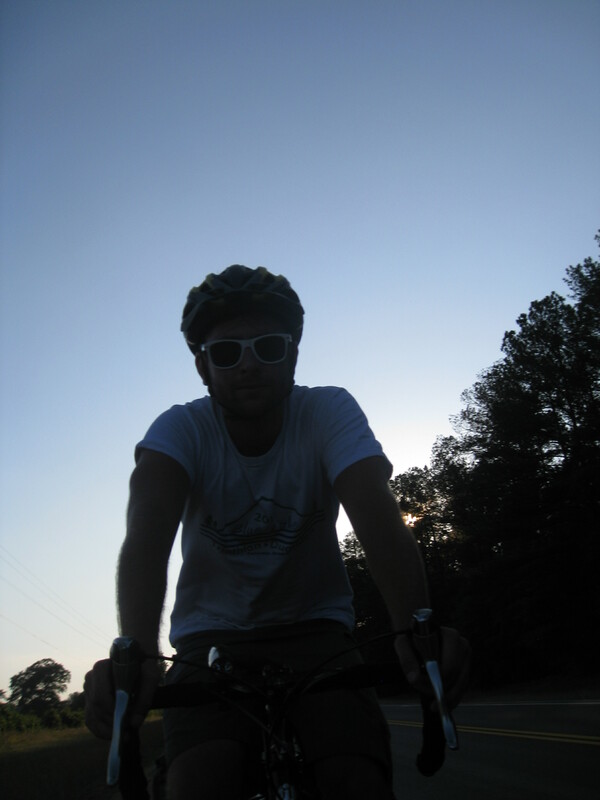 Posted on 15 May 2012, in Bicycle Touring, New Orleans to Newport. Bookmark the permalink. Leave a comment.